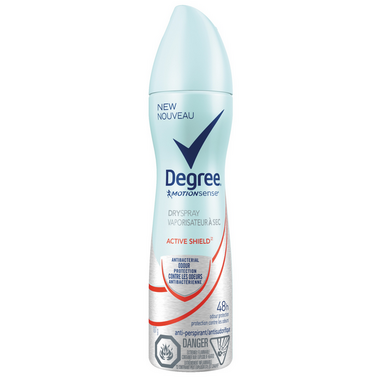 Try Degree® Dry Spray Antiperspirant Deodorant Active Shield™, it goes on instantly dry for a cleaner feel. This antiperspirant features Degree’s long lasting MOTIONSENSE® formula, and can help stop sweat and odour in its tracks. Degree Active Shield helps reduce odour-causing bacteria by over 9%. Less bacteria means less body odour, so you can stay fresh and confident all day. Motionsense is a breakthrough patent pending odour protection technology exclusive to Degree®. This formula contains smart capsules with direct movement response. It’s featured in Degree® Motionsense® and dry spray antiperspirants and Degree® Clinical ranges. Degree® Motionsense technology releases bursts of freshness with every move you make. The more you move, the more it works. Did you know? We mainly sweat to cool our bodies down, a process called thermoregulation. Our brain sends signals to perspire, releasing a clear fluid from over 3 million sweat glands (or sudoriferous glands) and as this fluid evaporates from our skin, it lowers our body temperature. When life demands more from you in the gym, in the office or out and about meeting friends, Degree Dry Spray Antiperspirant Deodorant Active Shield will help protect you from sweat and odour. This antiperspirant contains Degree® innovative MotionSense technology. It works like this: unique microcapsules sit on the surface of your skin. When you move, friction breaks those microcapsules and they release more fragrance. So every time you move, MotionSense keeps you fresh and free from odour. Ingredients: Cyclopentasiloxane, Aluminum Zirconium Tetrachlorohydrex, Stearyl Alcohol, C12-15 Alkyl Benzoate, PPG-14 Butyl Ether, Hydrogenated Castor Oil, Parfum, Polyethylene, Caprylic/Capric Triglyceride, Sodium Starch Octenylsuccinate, Maltodextrin, Hydrolyzed Corn Starch, Hydrated Silica, Gelatin Crosspolymer, BHT, Silica, Cellulose Gum. Good product. Great smell. Always keeps me dry.